As per our plan, we caught the 3am bus to the Race Retreat to enjoy our pre race bagel and get ourselves pumped for the marathon. Mary Poppins and her gang was in the photo op area again so we posed for a few before the line up started. We made the long walk out to K corral when the announcer called our letters over the speaker. Again, we spent the time in the corral listening to the race announcers, talking to our co-runners who waited amongst us, and watched several runners jump the barrier so they could take one last pee break in the field of darkness that was over to our right of the corral. Finally, it was our turn to start the race. 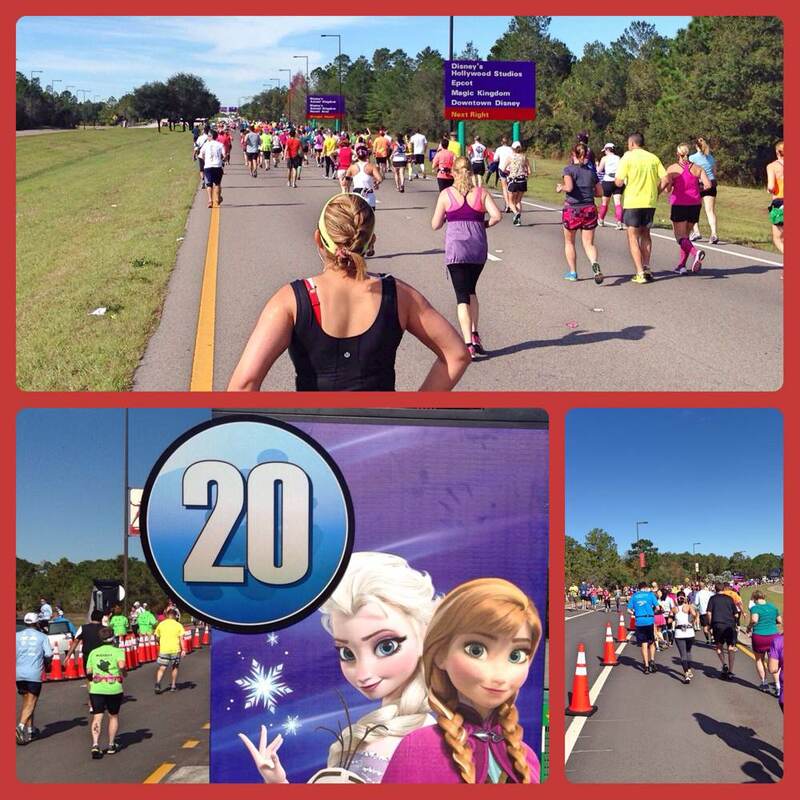 As we began our journey just outside of Epcot, we ran until we found mile marker number 2. We were sure to take a picture as this was the halfway point of our 4 day journey. Finally, we could say, “We made it halfway!”. We entered the Magic Kingdom just outside of 5 miles. Again, we felt the rush of energy and excitement as we entered Main Street, Tomorrowland and Cinderella’s Castle. By mile 6 we were outside of the Magic Kingdom and making our journey towards the Walt Disney World Speedway. This was a welcome change to the last time I ran this route as the course had been changed for the 2013 marathon anniversary. 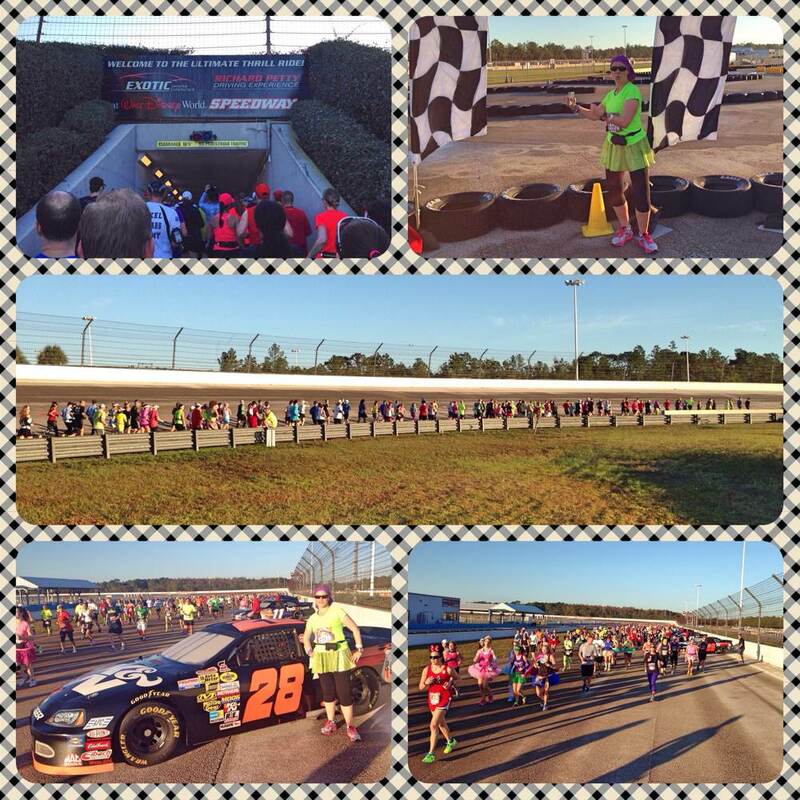 We actually got to run on the speedway. How cool is that? As well, there were several cars lining the speedway for runners to take pictures along the way. As we left the speedway, there were several miles of road until we came to mile 12 just outside Animal Kingdom. As we entered Animal Kingdom, we found ourselves running past Expedition Everest. We also saw a non-person runner. Wonder how far he got? 😉 Not really sure where I saw the Grave Diggers. I was tempted to lay down for a few minutes, but really, who’s kidding who? If I sat down, I don’t think I would have gotten up! 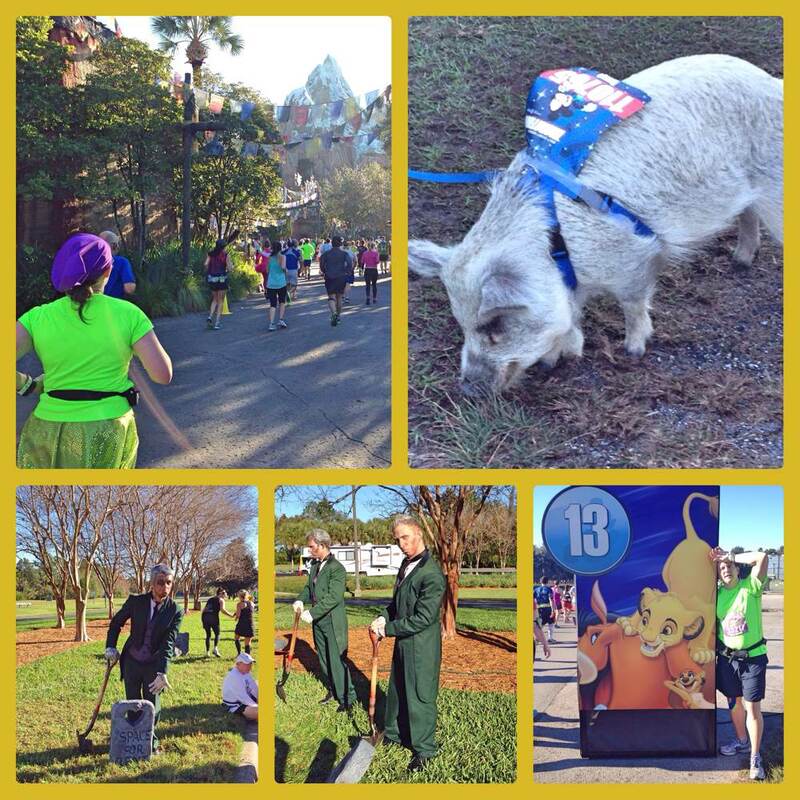 As we left Animal Kingdom we ran past the mile 13 marker. Almost halfway there! At some point I remember slathering on some Bio Freeze on my left hip and quad area. Nothing like getting a handful of the gooey gel and putting my hands down my tights to get it to the necessary area. No one thinks anything of it, as we are all in the same situation. 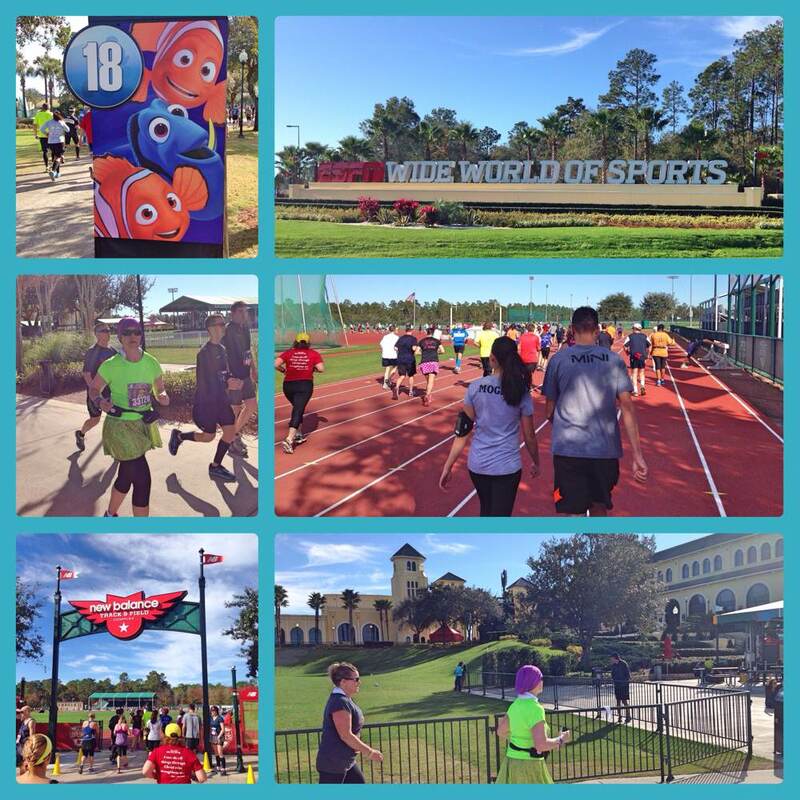 We ran several more miles before reaching our next stop at the ESPN Wide World of Sports Complex. This was another cool revision to the race course. We got to run around the track, and see ourselves on the big screen at the baseball diamond. The place is gigantic and if it weren’t for the runners ahead of me, I would have surely got lost. As we left the complex, we were well on our way to mile 20 and a few more miles before entering Hollywood studios. By this time, my quads and hamstrings really hated me, and it was easier for me to run than to do intervals. I just kept the pace and moved myself forward. One step at a time. It was a welcome sight to see Hollywood studios as I knew we were nearing the finish. The medical stops had run out of Bio Freeze and my quads had decided to fight me every step of the way. With my fists up, I battled back, and said “Move it”. They listened and followed direction, but they did so stubbornly. As we left Hollywood Studios just outside of mile 23 we entered a little more road and then the Disney Yacht Club area. There were tons of people cheering us on towards the finish, and I was able to find one more medical station with Bio Freeze. 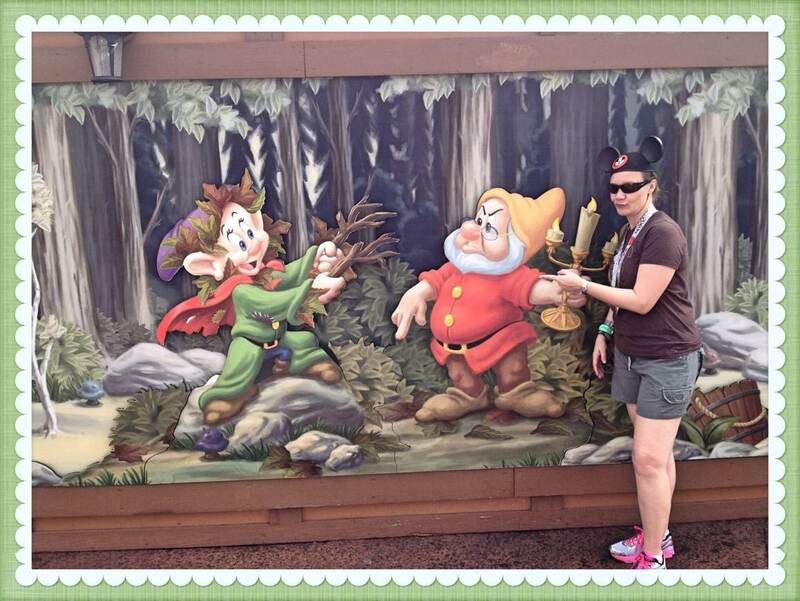 Just before entering Epcot, we saw Dopey cheering us on. He didn’t say anything, but I got the feeling he was laughing on the inside. At last we saw the iconic Spaceship Earth and we knew we had arrived. What a welcome sight. The crowds were cheering and I over heard a father tell his daughter who wanted to stop, “It’s just 200 yards!”. A few of us chimed in and said to her “You got this”. She proceeded on. As much as my quads hurt, I had that extra step in my gait near the finish line. The music was blaring, the crowds were cheering; I couldn’t help but do a little running dance as I ran into the last stretch. I think I even gave Mickey a High-Five! We crossed the finish line upright and smiling. 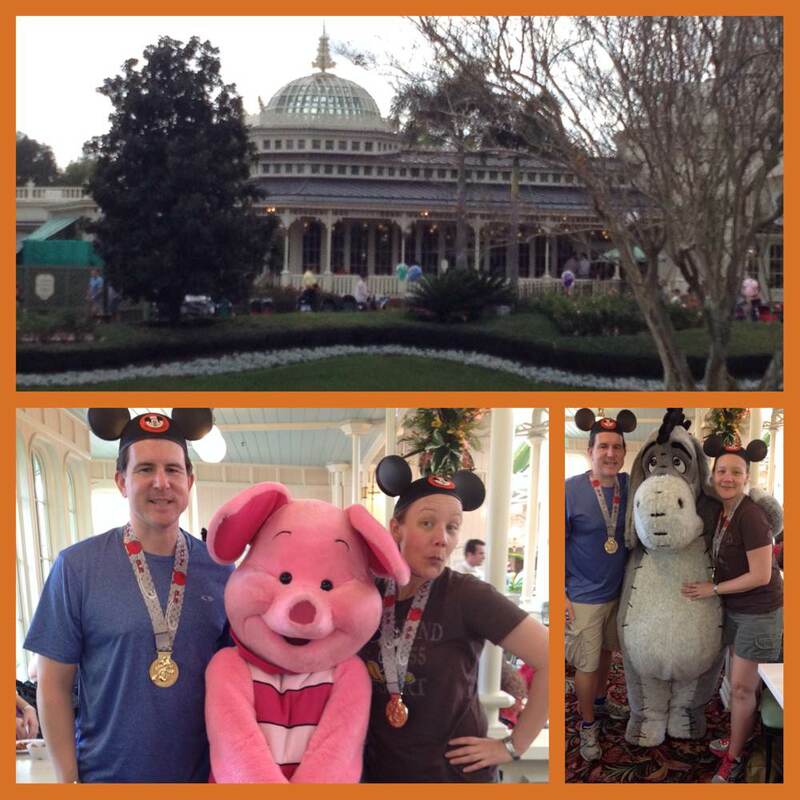 We made our way to the medal area and first received our Mickey Marathon medal. 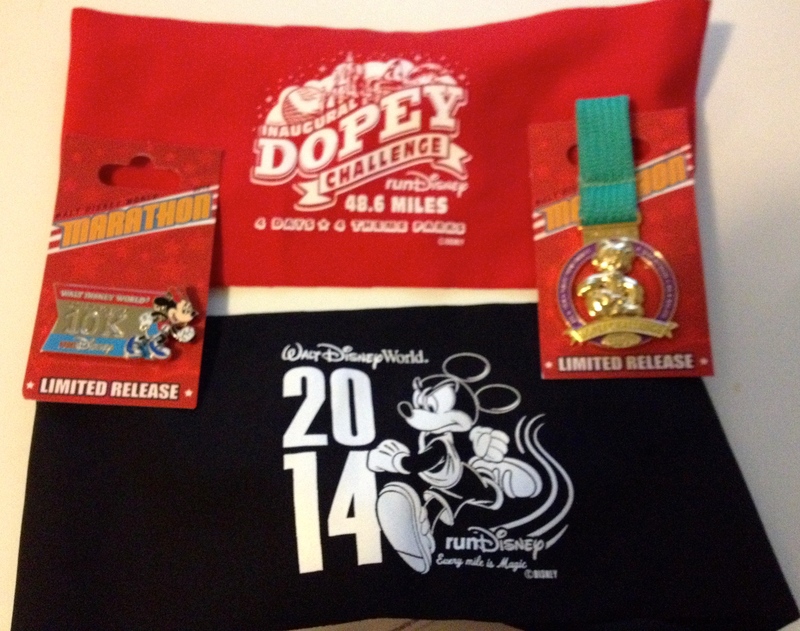 Next up was Goofy, and then finally, the coveted Dopey inaugural bling! Two Dopeys on the run….WE DID IT! Spaceship Earth – We have arrived! The PAYOFF! Mickey, Goofy and Dopey medals. After the race, we went to the medical area for some ice. I think this added a nice touch to my Dopey outfit. After leaving the medical area, we made our way back to the Race Retreat to have lunch and changed into some warmer clothes. 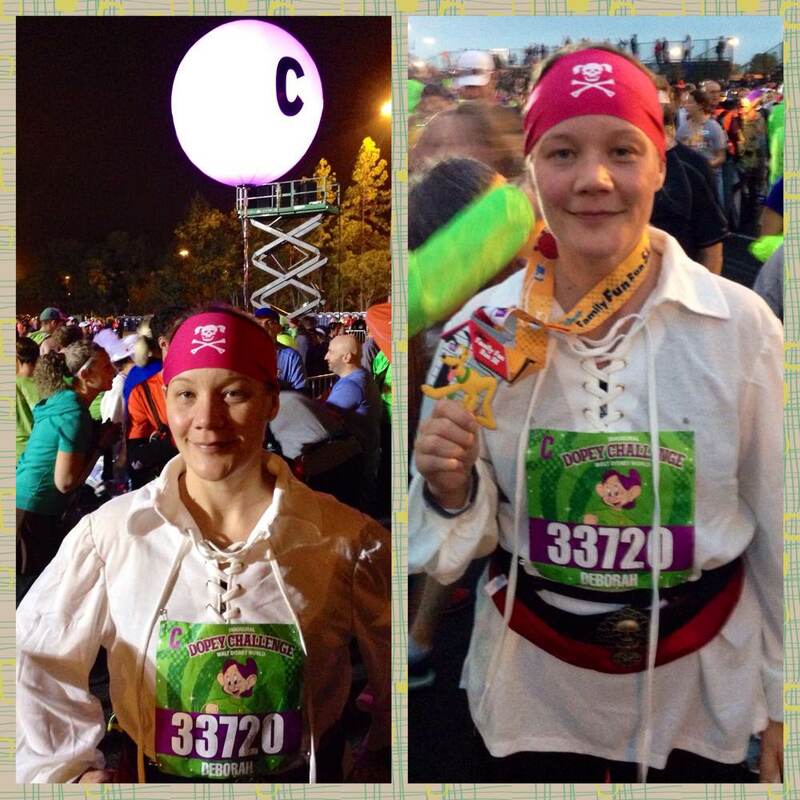 We met up with Tabetha and her group and shared our marathon stories. It was a nice relaxing way to finish off our marathon. But wait! It wasn’t over just yet….it was only mid afternoon! We jumped (more like shuffled) our way to the shuttle bus and cleaned up at the resort. We then made our way to Hollywood Studios for some celebratory fun. 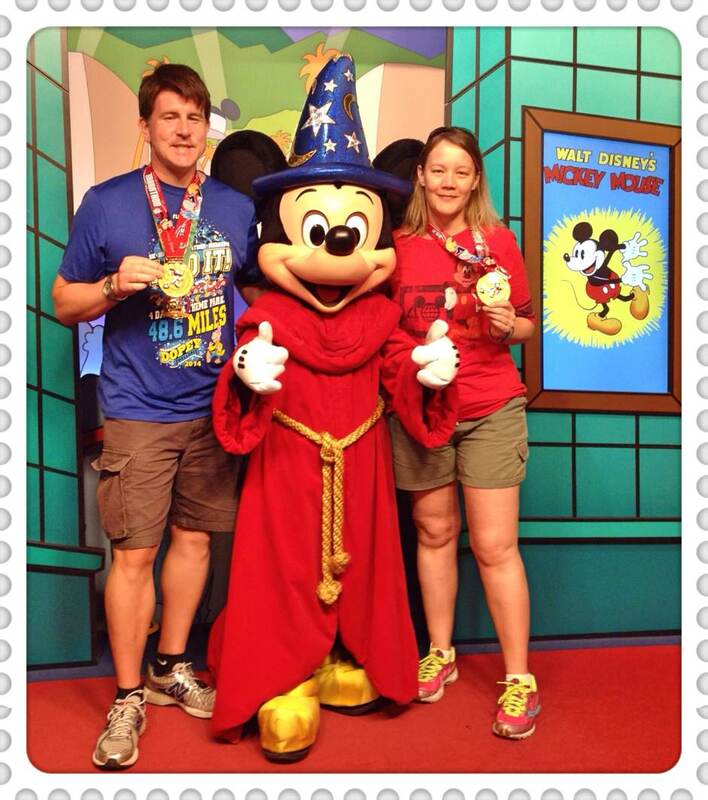 We found Mickey and of course had to show him our marathon bling. Two thumbs up from Mickey! 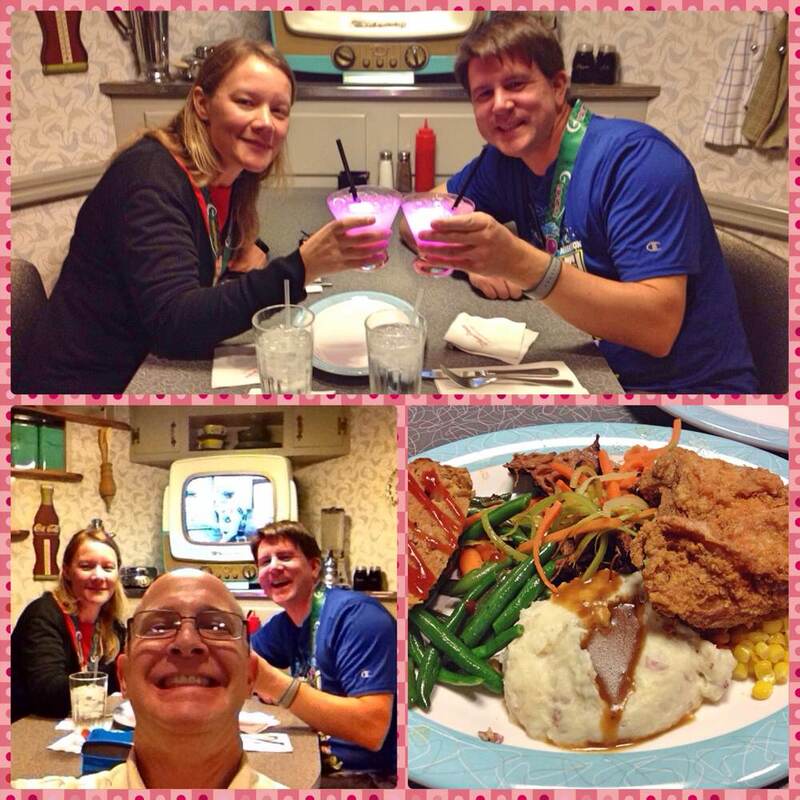 Later in the day, we dined at the 50’s Prime Time Cafe in Hollywood Studios. Nothing like a good home cooked comfort meal after running a marathon. The celebratory drink was pretty snazzy too as our ice cubes lit up! We were famished! 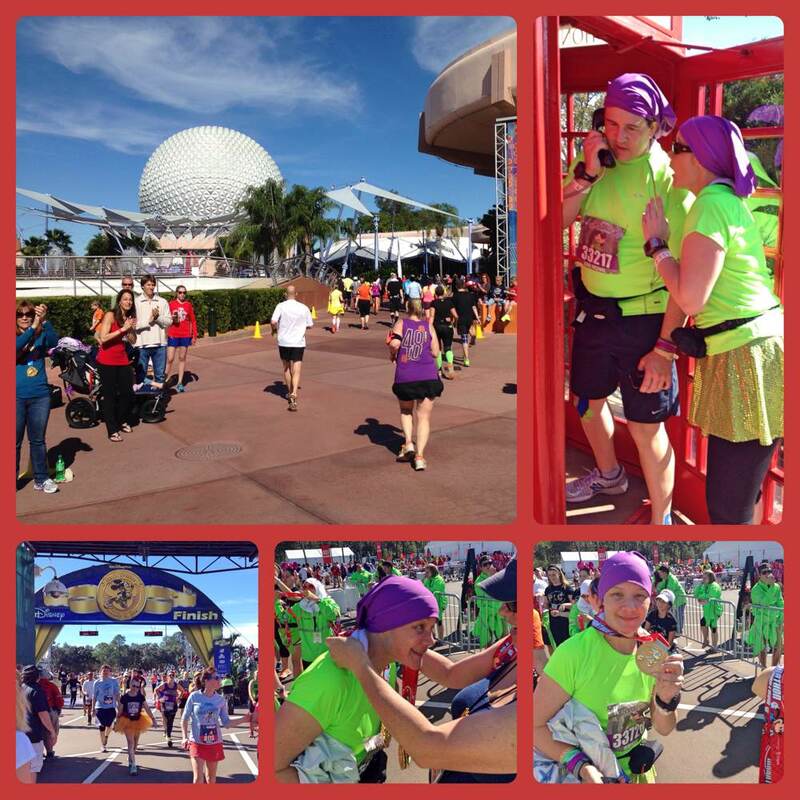 Finishing the Dopey Challenge and the marathon was an amazing experience. I’m not sure if I would have done anything differently. We paced ourselves accordingly to deal with the traffic, the heat and to allow ourselves enough stamina as each day got progressively longer in mileage. Of course, we could have done a little less theme park and a little more sleeping, however, I’m pretty amped at a WDW running vacation. The adrenaline just keeps me going. By the time we finished our meals at the Prime Time Cafe, I think we were pretty wiped out. Relaxation mode started to kick in – No more races to run. We knew we had to go back to the resort and start packing up our things for the flight back to Toronto the following day. We were able to spend a few more hours at the Magic Kingdom on Monday before saying so long to Walt Disney World for 2014. But wait…is that all? Is that where it all ends? 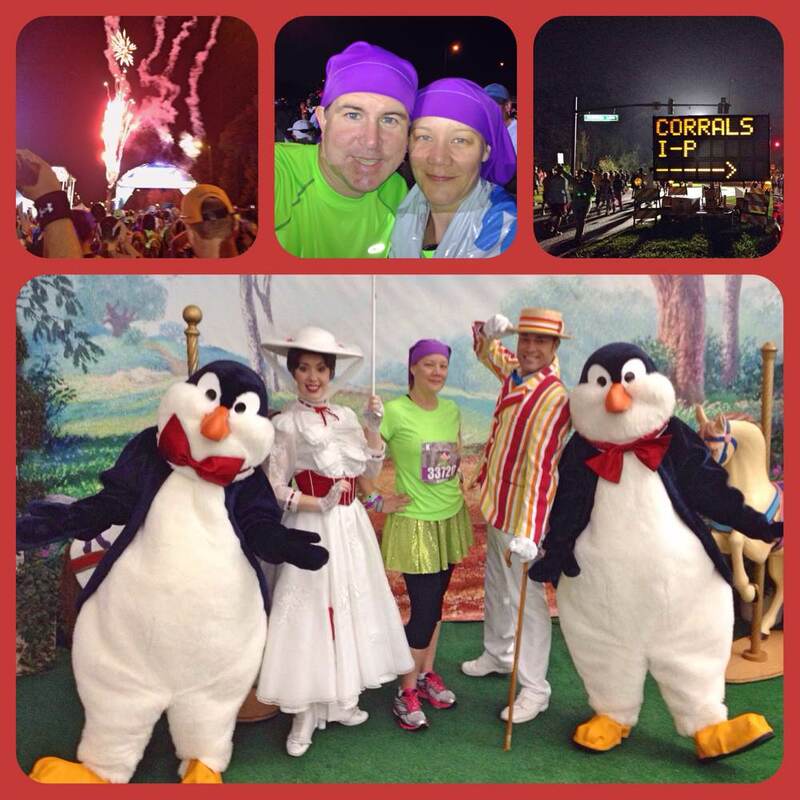 A few days later, we were going to say “Hello to Disneyland”, to participate in another 3 races at the Tinker Bell weekend in California. We had two days to rest and recover before we had to take to the pavement yet again. 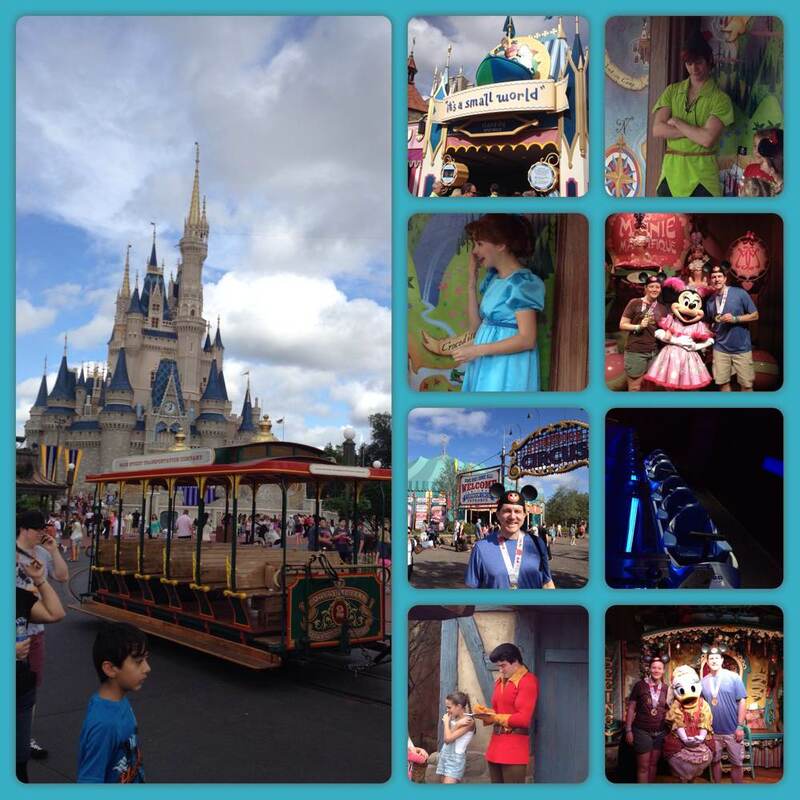 It’s funny how we were at WDW just days ago, and yet the whole experience went by so fast, it’s almost a blur now. Thank goodness I took lots of pictures so I can recall exactly what it was that we did! We made our way to the start via the WDW shuttle bus. We found ourselves in the midst of the other excited but sleep deprived runners, waiting at the last minutes before they had to rally over to the start corrals and wait patiently for their herding to the start. We gazed at all the costumes in our midst for a while and then suddenly, out of no where, walking up to us was Tabetha of I Run on Water, her husband Greg and their sisters, Rachael and Kathryn. What a great site to see! I had known about their car trip extravaganza, so I was so excited that they had finally arrived. Hugs for all! We chatted a bit. Caught up on the craziness they endured, and then parted ways so that we could find our corrals and organize our race plans. And of course, just like I would forget to turn off my Garmin after crossing the finish, not two minutes after we parted, and I said to myself, “darn, I forgot to get pics of us all”. We corralled ourselves, and got to the start when it was time for the C group to begin. I have to say, I don’t recall to much about this race, other than being slightly annoyed by the bottle necking on the course. There were moments when we were on wide passages of road way, only to be filtered into narrow passages of road about one lane way thick. It was like sucking on a milkshake through a coffee straw. We all just didn’t fit. The runners struggled to pass the walkers, and the walkers for the most part kept in groups of twos, however, sometimes those groups of twos became groups of 4 and 6. They weren’t together as a group, but the walls were starting to form. I wasn’t going to push through, so I just kept my line and continued on in the best way I could. It was still dark, and difficult to see in parts as well. There weren’t a ton of highlights during the race. The first 3.5 miles was road, so nothing really to see. I kinda felt like it was missing a bit of the magic, but I was still glad to be running. You know…it was Disney after all. We eventually hit Epcot where there were a few picture ops along the way. I like running in Epcot. It has a certain zen feeling for me as I ran along the water. Waiting in the corrals at the start. Peter finds another Peter. Smee and Captain Hook. End of race with Minnie 10K bling. After we finished the race, we didn’t waste much time. We jumped aboard the bus back to the Coronado Springs, and got ourselves ready for the day to explore the Magic Kingdom. Magic Kingdom here we come! Our first point of interest was Space Mountain. We had our Fast Pass already arranged. Nothing like spending the first moments at WDW getting a thrill. Afterwards, we strolled around the new Fantasyland area and took in the sites. More rides, and window shopping ensued. Before long it was our lunch at Crystal Palace with Winnie the Pooh and gang. Crystal Palace is always cheerful and fun. One day, I’m going to jump in when they do the mini Character parade around the restaurant. For today though…I left it for the kiddies. After lunch we spent some more time walking the various areas of the park. Before long, it was late afternoon. It was getting hot, an Kari was getting grumpy, so I knew just what would cheer him up. 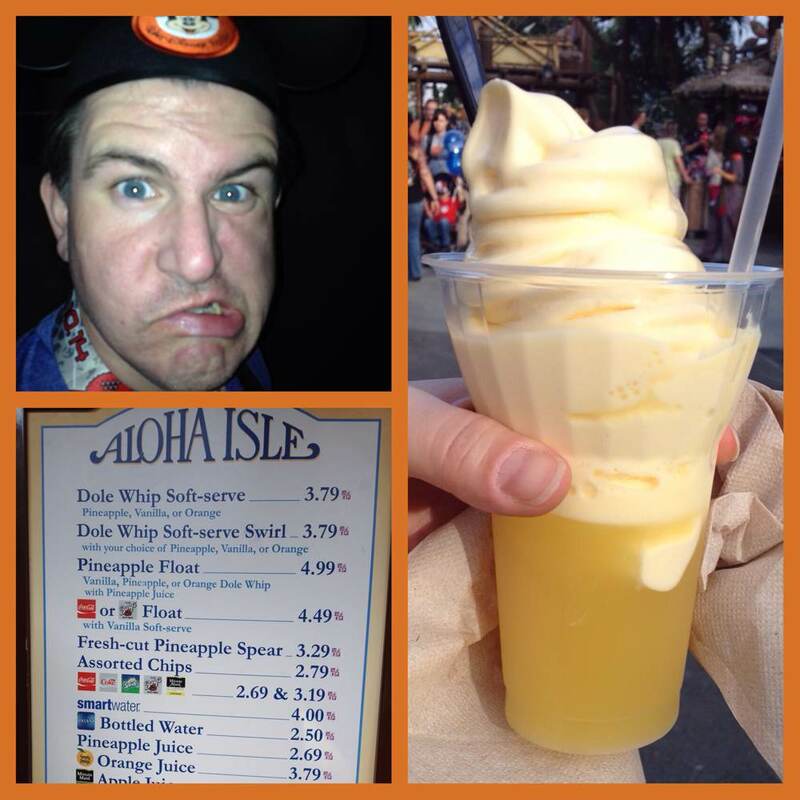 Nothing like a Dole Whip! 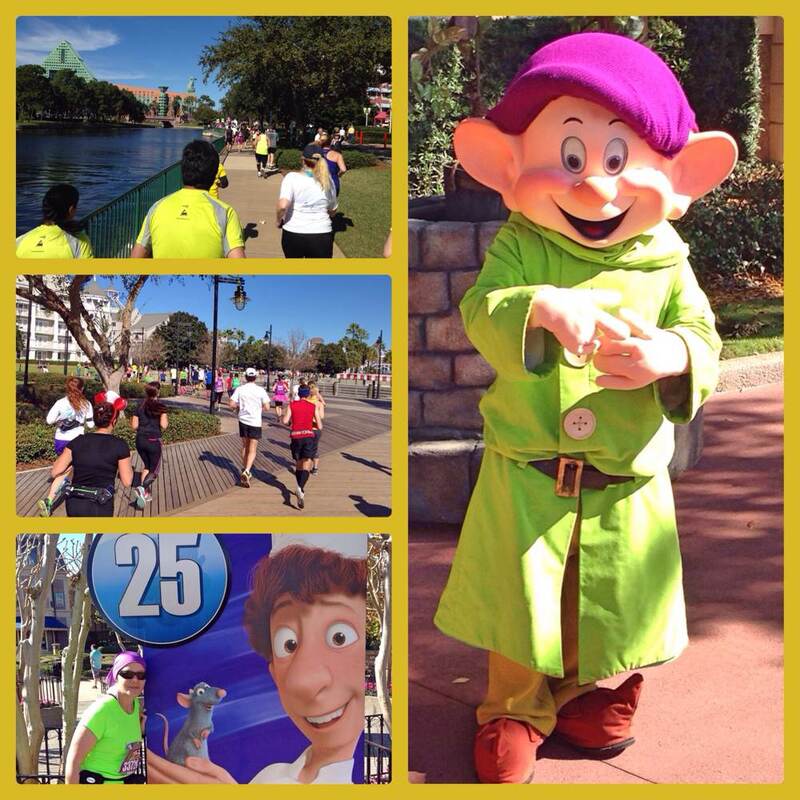 I missed the photo op during the 5k for Dopey. The line was the longest I have ever seen for a character during a race. So I settled for this at MK. By the end of the afternoon, we were ready to pack it in. We headed back to our resort and grabbed a Quick bite at our Quick Service restaurant before resting our tired heads. The half marathon was the following morning, so we needed a good nights sleep. As soon as I rested my head a top my pillow on Wednesday night, the alarm sounded and it was 3:45am on Thursday morning. Or at least it felt that way! 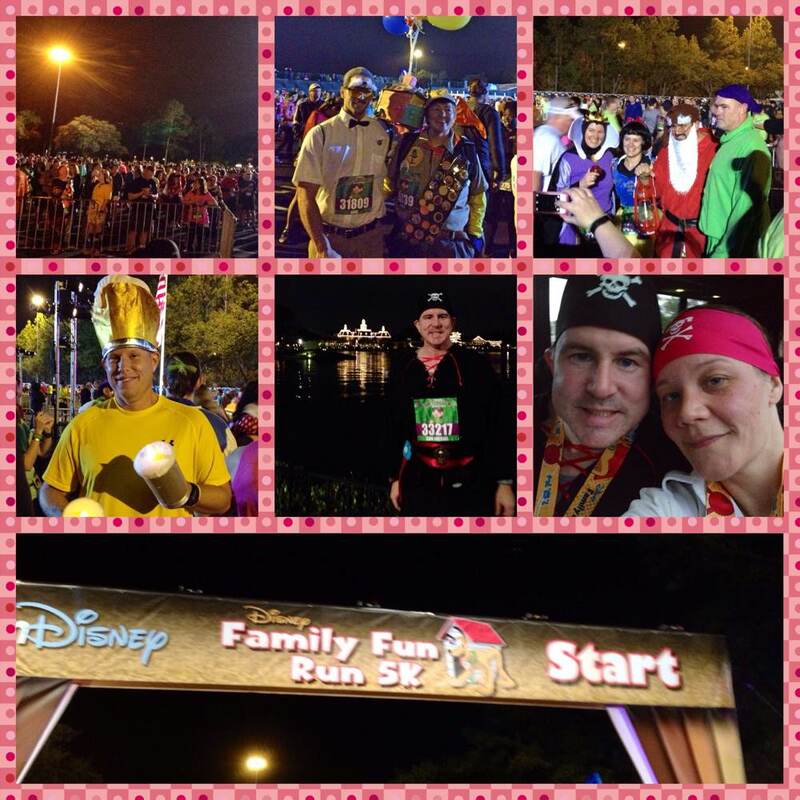 Time to arise and prepare for the 2014 WDW 5K Family Fun Run. I have a bit of a routine for race days when I’m away from home…. Step 1 – Make my way to the coffee maker and prepare my one cup – compliments of the resort. Step 2 – Down a bottle of water. We left the resort room just before 5am and promptly got on the bus. It was a short drive to the start area. As we departed the bus, we slowly walked towards the main area where the runners were gathered. We saw some excellent costumes that morning. 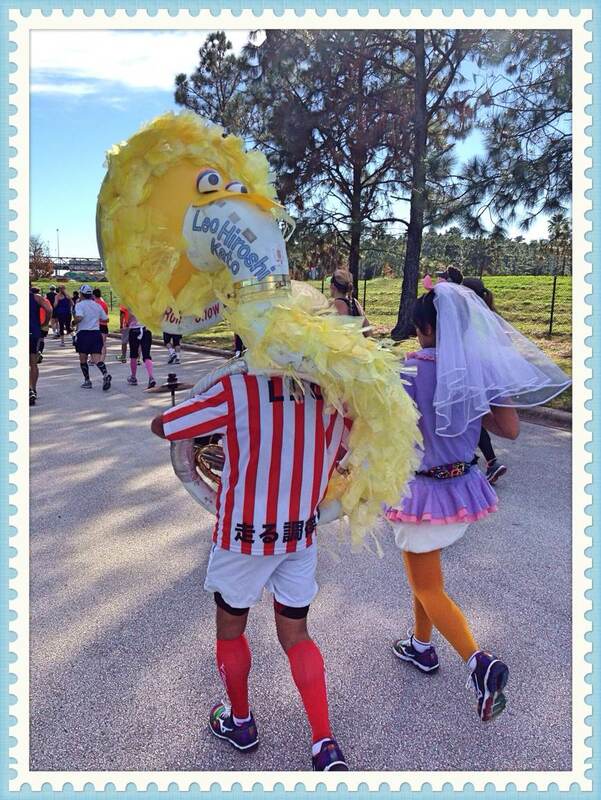 The 5K always brings out the best costumes. 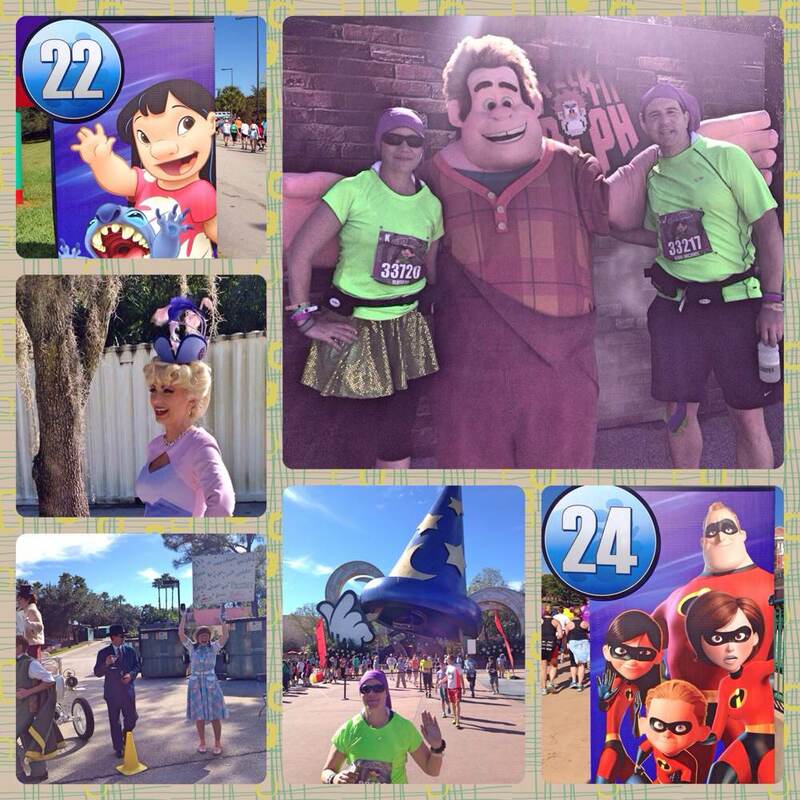 Now, I’ve never had a lot of goals during a Disney 5K race. They tend to be overly crowded and the respected rule of, walk on the right, run on the left is never adhered to. I come with no expectations other than to finish. We ran some, and then walked some due to being blocked on the course. I didn’t mind much as I knew I had 3 more days of running, and over exerting myself on a 5K was not on my agenda. According to my Garmin, we finished just over 38 minutes. Not a PR by any account. 3 more races to go. Standing in C corral waiting for our turn to run. End of race with Pluto! As mentioned, the late afternoon brought in some rain so we left AK to make our way to the resort. 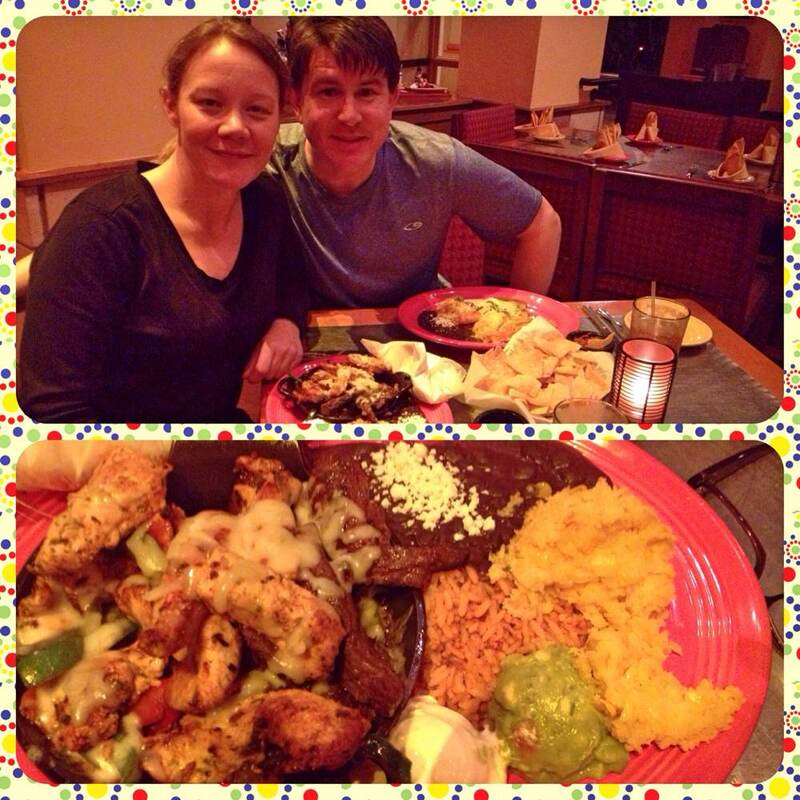 We had reservations at the Maya Grill, which luckily was at our own resort. I was really pleased with my steak and chicken fajita skillet, served with beans, rice and corn soufflé (which was perfecto). And what meal isn’t complete without some fried ice cream? Oh yeah, we had that too! Our second day at Walt Disney World was complete. The night was getting on and it was past our bed time. 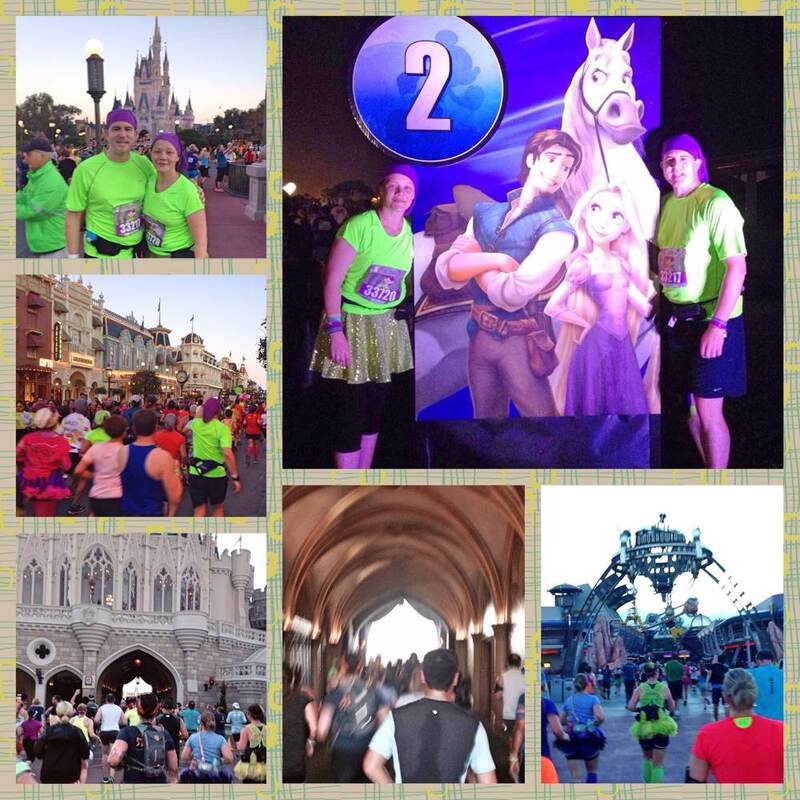 (our bedtime is no later than 9pm on these trips) It was time to prepare for the 10K Minnie race the following day. We headed back to our resort. 7 races in 11 days and WE DID IT! Wow! What a crazy, wonderful, and exhilarating experience. WE DID IT! We ran 7 races in 11 days. A Total of 114.4 kms at Walt Disney World and Disneyland. 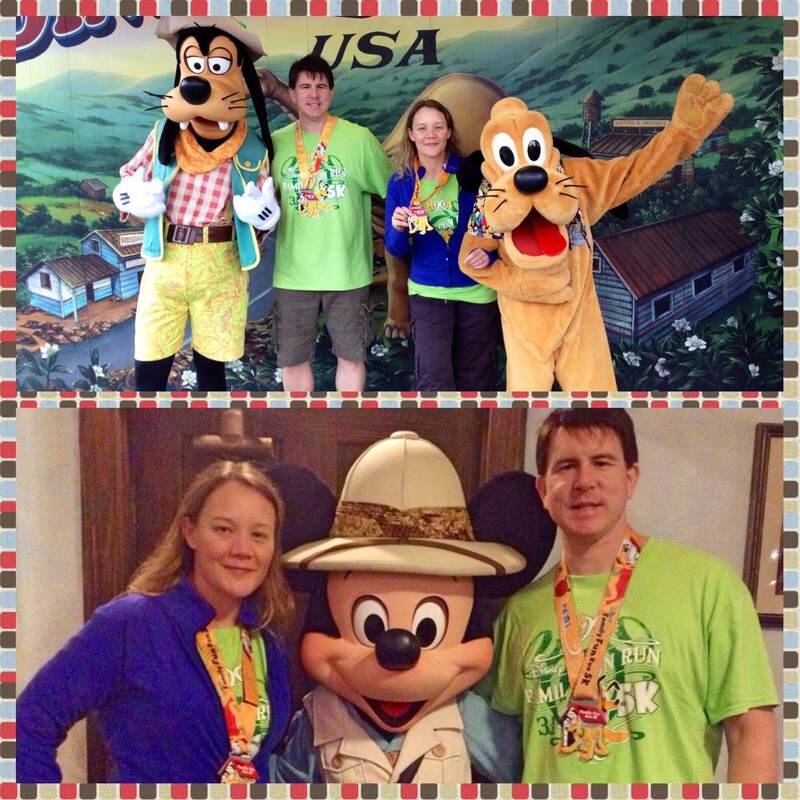 We earned the rights to brag about our Dopey Challenge accomplishment, and earned our Coast To Coast medal for 2014. Now the first trip to Walt Disney World didn’t come off without a hitch. We had our worries even before we were fully packed. The weather leading up to our Wednesday departure was frightfully cold in the North East. Airports were cancelling flights on the Monday and Tuesday. We were monitoring our chances of our own flight taking off first thing Wednesday morning. We were hopeful as Air Canada’s flights to Orlando were still flying on the Tuesday with small delays, but it didn’t comfort us completely. I was only going to be completely content once we were up in the air and on our way. We got lucky and our flight did take off on Wednesday with a slight delay as we sat on the apron. However, some travellers were not as fortunate. I Run on Water was one of the stranded passengers who had to make alternative arrangements. Check out her story here. Once we arrived, we jumped on the Disney Magical Express which would take us to the Coronado Springs resort on the Walt Disney World property. This is a beautiful property in one of the moderate categories that WDW offers. I enjoyed the complex very much. The only drawback is the size of the complex. It’s HUGE! One must walk A LOT to get from their room to the main lobby and dining areas. We were OK with that, however, I can see why some people who have reviewed this resort are not favourable towards it. If a person doesn’t like to walk, this place is definitely not for them. 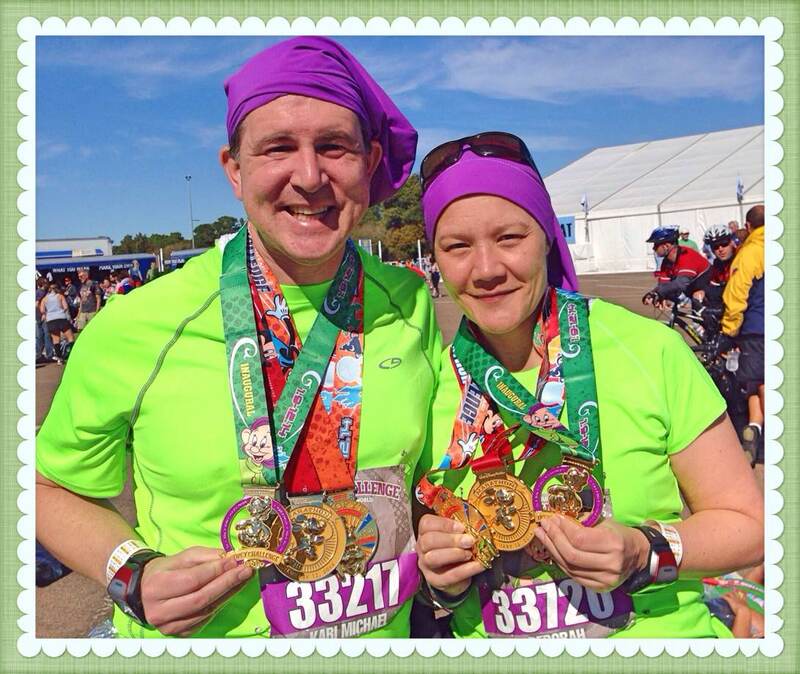 Once we were settled, we headed for the WDW Marathon Expo to pick up our race kits and to do some shopping. It was pretty easy getting to the Expo as WDW had several shuttle buses. I don’t think we waited more than 5 minutes for a bus. Coronado Springs isn’t too far from the ESPN Wide World of Sports Complex so it was a short drive. We picked up our race kits and shirts. The process was a breeze. 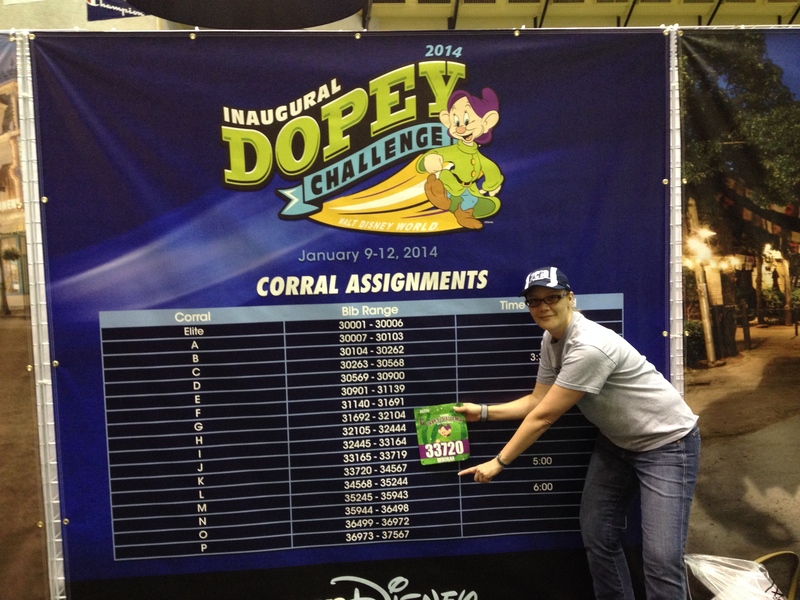 We headed to the Dopey booth and got our race bibs. Once that was done, we walked over and picked up our shirts. What was nice is that Disney had pre packaged all the Dopey shirts based on the size requested when we registered. The volunteer just grabbed the appropriate bag of shirts and handed them over. Done! I loved the shirts this year. I’m not sure if this was the first year as I haven’t been to WDW race weekend since 2012, but they decided to change the fabric of the shirts to a much softer material. As well, I thought the colours were awesome. Dopey Corrals – 33720 started K corral. My bib number! I purchased a few things at the expo – KT Tape, race pins, and a couple of Bondi Bands to commemorate the race weekend. I also bought a much wanted SPI Belt and Dopey running cap. I have to say, I was a little disappointed with the clothing selection. I was hoping to get a nice Dopey shirt in perhaps a purple or green in which his clothing is representative of; however the commemorative Dopey clothing was red and white. I thought that was peculiar. My spouse bought a blue Dopey “I DID IT” shirt. I’m a little superstitious, and refused to buy as I had not completed it yet. Of course, I lost out on buying the women’s pink edition as they were sold out after the marathon. 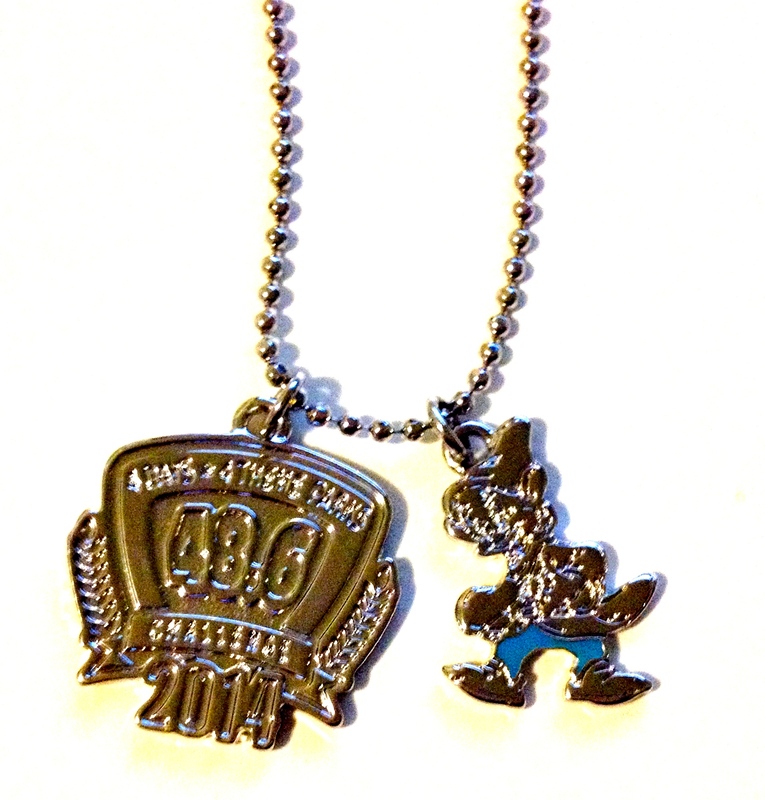 No worries, I had a commemorative Dopey necklace I had purchased at registration instead. Our dinner at Sanaa was fantastic. The highlight was the appetizer which featured 9 different dips served with Naan bread. Can you say “scrumptious”? Indeed it was. Not only were we full on great food on our first day, we were also very filled mentally to the point of exhaustion. We had been up since 2am Wednesday morning, and by the time we got back to our resort it was around 10pm. We quickly put out our race clothes for the Family 5K which was to start at 6:15 am Thursday morning. Which meant, we had to wake up at 3:45am to jump on the 5 am shuttle bus to the race location. We were asleep shortly after we arrived…..the adventure was about to begin. Stay tuned. I’ll have more on race weekend in my next blog. I hope everyone had a wonderful holiday season, and enjoyed some time with family and friends. I myself was visiting family in Ottawa and Hamilton. Luckily, I witnessed a little snow during Christmas in Ottawa as Toronto had none at that time. Now that the holiday season is over, I’ve been back at my training. I had to run on my treadmill for a few runs, but luckily the sidewalks have been clear enough this week to run outside. I had a wonderful long run last Sunday, and I followed it up today with 6K. The weather has been above zero degrees C, which is perfect weather for me. 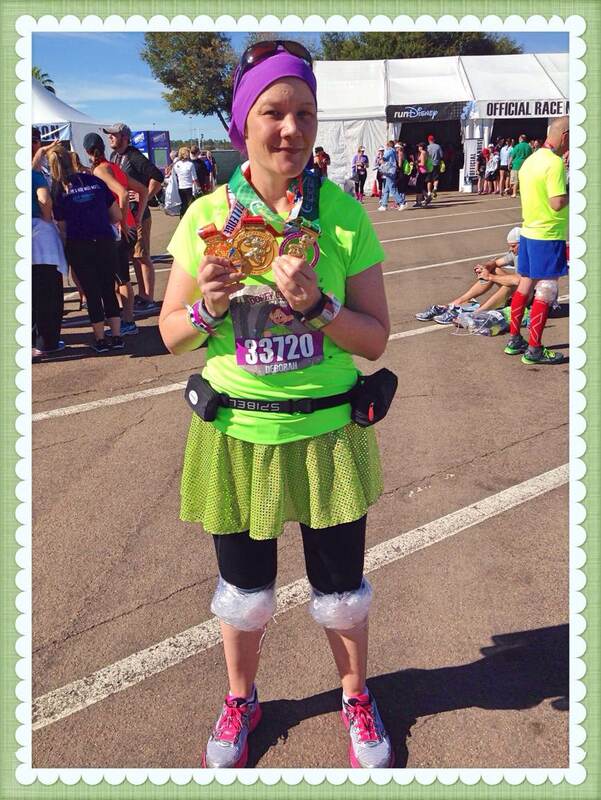 Soon enough, I will be headed to California to run the Tinker Bell Half marathon in Anaheim. Of course, this is a fun run for me. I take a lot of pictures and video, so that tends to slow me down considerably, but it’s also a great way to keep the cardio during the colder months. I must admit, I’m looking forward to the warmer temperatures as well. 🙂 If anyone out there is also racing this event, please let me know. I of course will also be wearing my shrug on the race course (weather permitting) and in and around the parks, so if you do see me, please say hello. Speaking of Disney’s Tinker Bell half marathon, I’m sure many are getting ready to depart to Walt Disney World for the Marathon weekend. For anyone out there who is participating in any of the races, have a fantastic time. I’m sure it will be an awesome experience for you as it’s the 20th anniversary of the Mickey Marathon. There will be much to celebrate. The temperatures in Florida seem to be warm right now, so please keep yourself hydrated during the race. I look forward to reading all the race reports. If you are not racing this month, I hope you are keeping well and staying active. I started running in 2008. I don’t exactly know what it was that prompted me to do so. Perhaps I had the need to be more active. It’s relatively easy to do in terms of equipment: good shoes and my favourite tunes on my iPod. I really started to enjoy it, and wanted to learn more to improve my race times. I went to my local running clinic and signed up for a 10k clinic. It was during this clinic that I learned about the Goofy Challenge at Walt Disney World. Well, say no more. Running & Disney combined? I was hooked!! In 2009, I began my training for the Goofy. I called it, “39 miles before turning 39” (which I was turning a few days later) I even signed up for the 5k that weekend, which unofficially is called the ‘Dopey’. Which I guess has some truth to it! I mean, who wants to race in the same weekend; a 5k on Friday, a half marathon on Saturday and a full marathon on Sunday? Most people don’t. Us runners? We seem to be an excessive bunch! 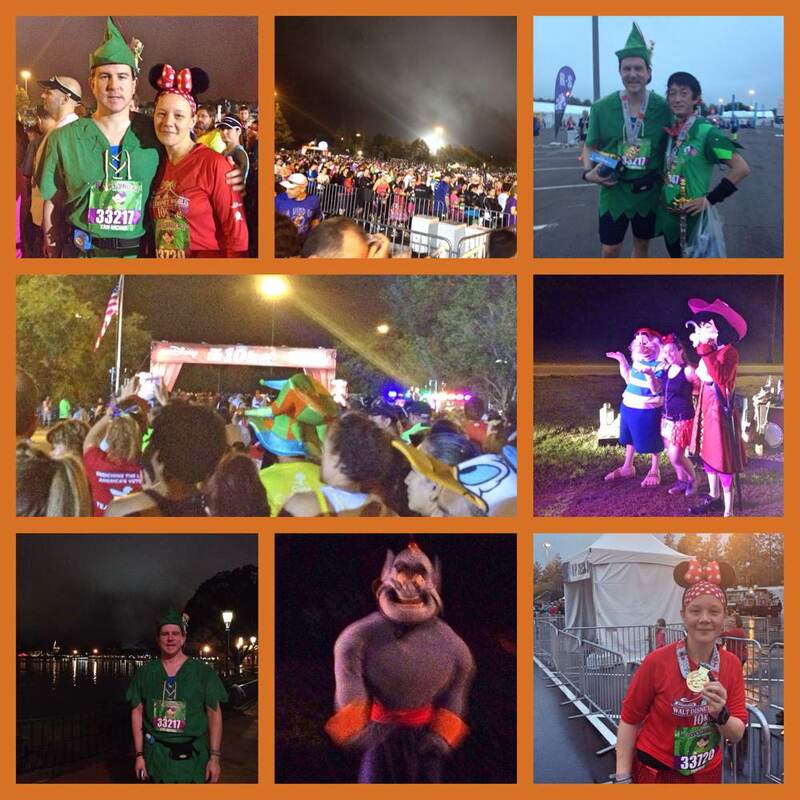 However, as a traveller to Disney, my thought was, if I was going to experience the WDW marathon weekend, I was going to do it all. The 2010 Walt Disney World Marathon Weekend had the worst weather on record. I think it was colder in Florida than it was in Toronto. The news reported orange groves freezing over. There was sleet and ice on the race course. It was dreadful for locals whom were not accustomed to winter weather of this nature. For me though, my pursuit for Goofy was all the motivation I required. Nothing was going to stand in my way! I’ll admit it was painful. For the first 18 miles, I was able to shut out the pain from my mind, concentrate on my run and just enjoy the race. The last 8 miles however is when I felt my body shutting down. It was at this time, that my mind kept me going. It’s surprising what you can accomplish when you think positive. I envisioned crossing the finish line and receiving my medals. I looked back on all my training leading up to the race, and in that moment, nothing was going to stand in my way to achieve my goal. One of my favourite sayings is from Walt Disney himself. “If we can dream it, we can do it”. Sometimes, that is all the motivation I need. 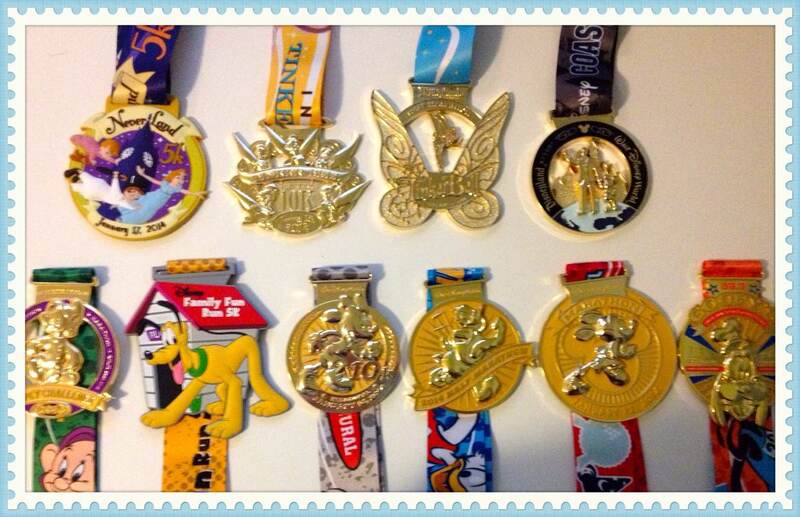 I look back at the 2010 Walt Disney World Marathon Weekend as one of my fondest running achievements. What is your favourite running adventure and why?